Bak kwa, our beloved Chinese New Year staple, has already started making its rounds – in stranger ways than you might imagine. This smoky, savoury snack is now more than a sheet of delicious charcoal-grilled meat – from sneaking its way into gourmet sweets, to transforming nostalgic childhood snacks. Fitting, for the Year of the Pig. 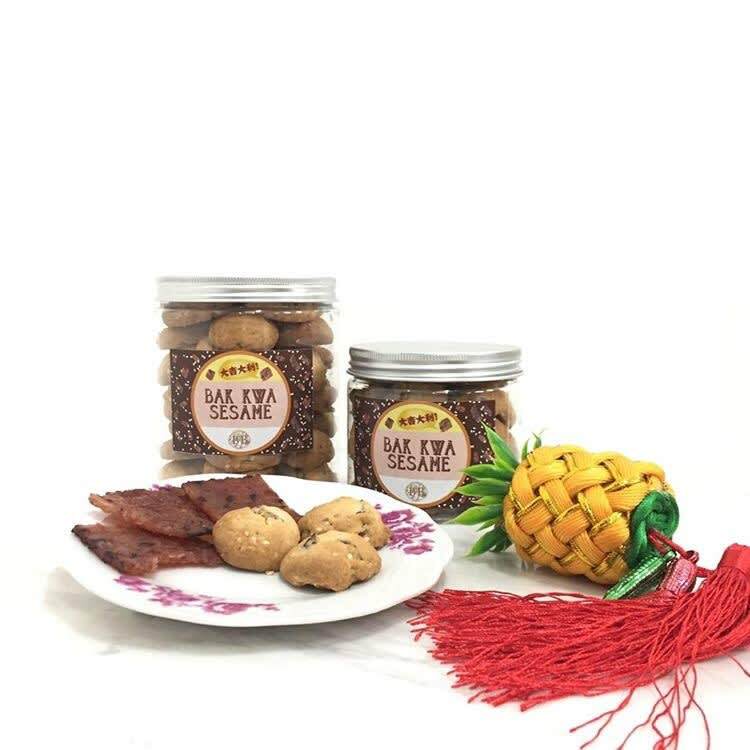 Baker’s Brew’s Pineapple Bak Kwa Cookies is a double dose for festive snacking, combining not one, but two CNY classics into one treat. More like a traditional pineapple tart than a typical cookie, this hybrid’s golden crust hides a special filling of sweet Thai pineapple paste that is blended with fresh bak kwa. Each bite is buttery, sweet, and savoury – the perfectly balanced CNY snack. Kettle honey dijon chips and fancy black truffle parmesan chips are great and all – but my OG potato chip brand will always be Jack n’ Jill. There’s something about the feathery crunch and suspiciously addictive seasoning that takes me right back to my primary school days. 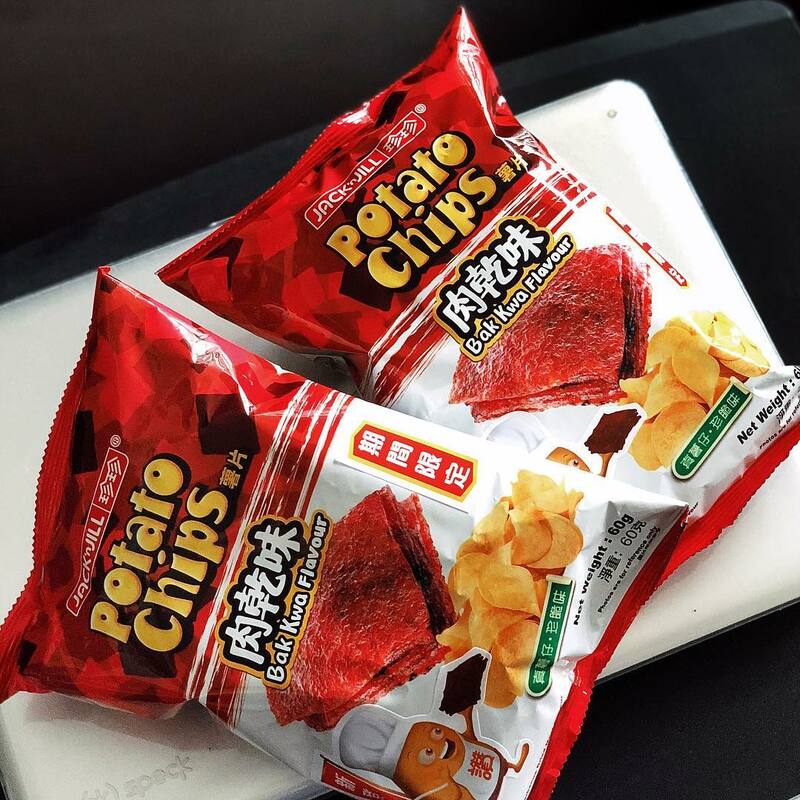 Surprisingly enough, their new Bak Kwa Flavor Potato Chips DO give off the flavor of smoky-sweet seasoned pork. Texture and mouthfeel-wise, it’s not the same as a fatty slice of bak kwa, but these are interestingly addictive enough to keep you reaching for more. Bak kwa, pork floss and French pastries seem like an unlikely trio. 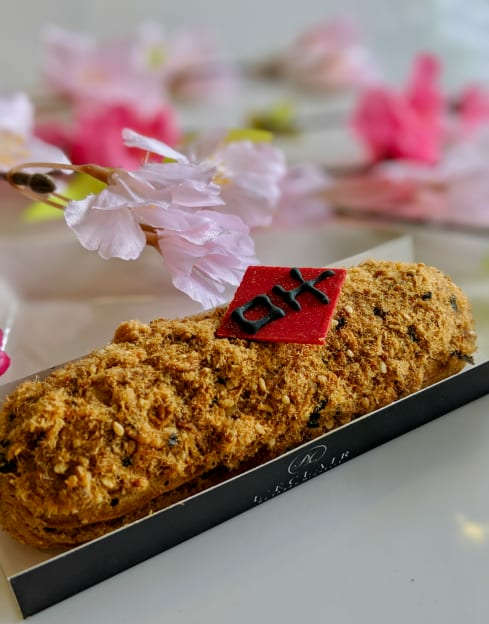 Back by popular demand, L’Eclair’s limited edition Bak Kwa Pork Floss Eclair is a treat to try this CNY. 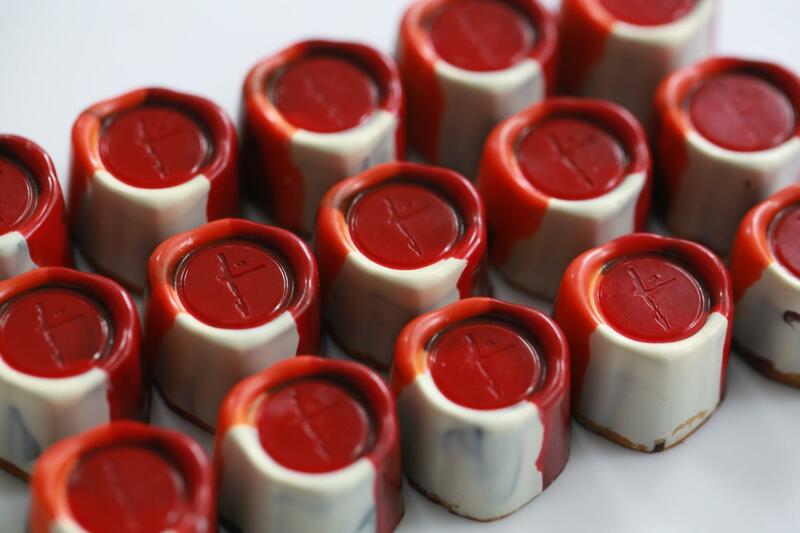 Fresh milk and cream is first infused with Bee Cheng Hiang bak kwa, before being cooked down into a pastry cream that’s piped into choux pastry shells. The eclairs are finished off with a generous dusting of fluffy pork floss, creating a savoury-sweet triple threat of flavour, texture and creativity. They’re only available from 15 Jan to 24 Feb, along with other CNY seasonals like Pineapple Tart and Mandarin Orange, so place your orders fast! 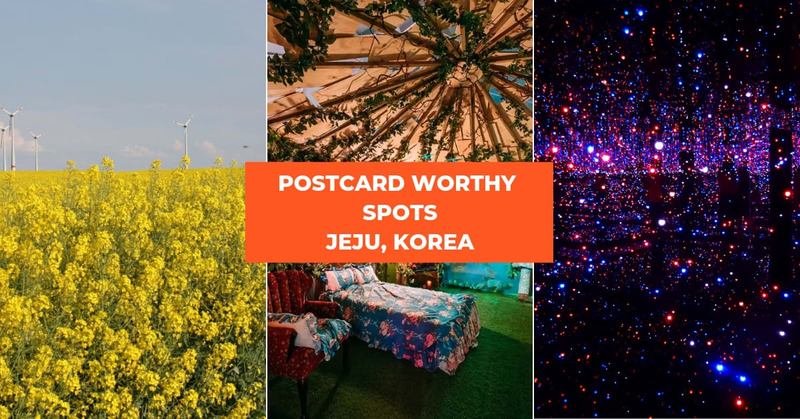 They have a ton of creative eclair flavours worth a try – get a discount off their High Tea Degustation set by booking through Klook! 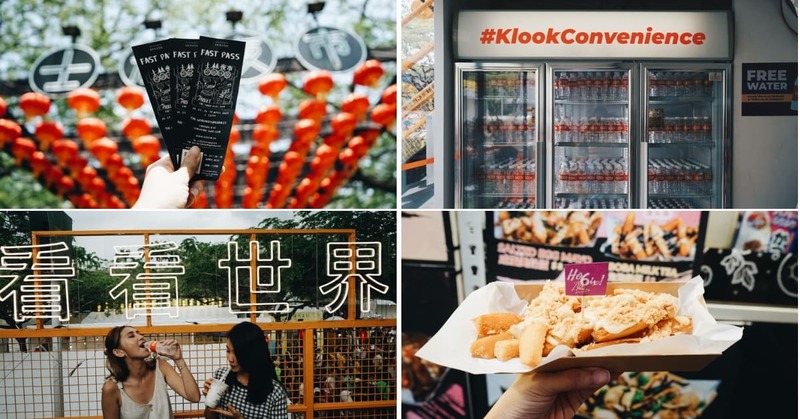 Even if you’re not a sweet-and-salty mixed popcorn kind of person, The Kettle Gourmet’s Bak Kwa Popcorn could change your mind. This CNY favorite has been turned into a crispy, airy-light snack that’s perfect for sharing. 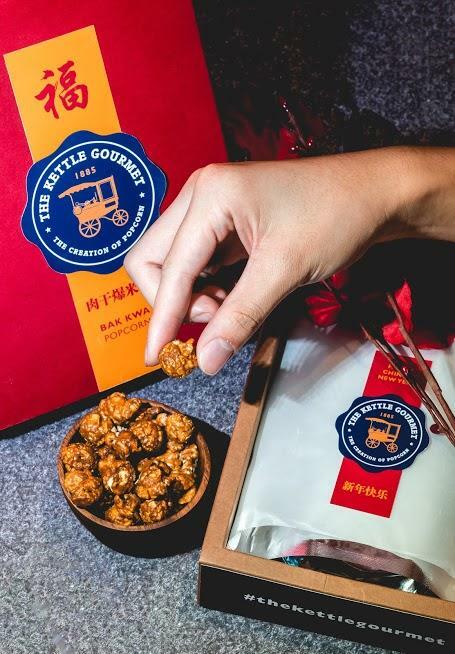 And unlike traditional calorie-dense bak kwa slices, these are slightly more forgiving on the waistline – the local gourmet popcorn startup bakes all their small-batch popcorn by hand, using non-GMO corn kernels. Sweet and salty is a combination that rules the dessert kingdom – from salted caramel to Snickers bars. 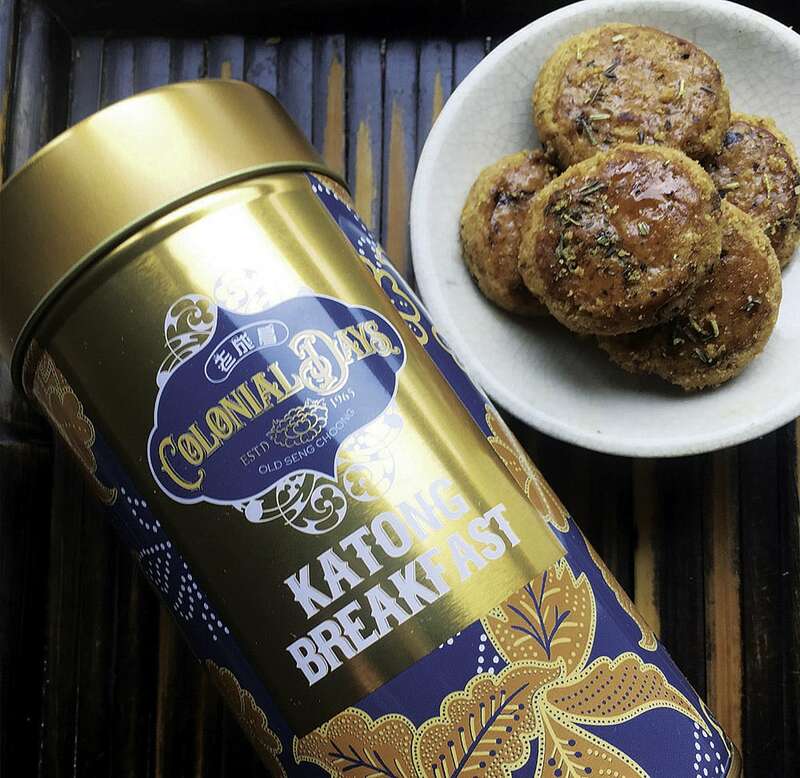 Old Seng Choong puts a spin on this duo with their Smokey Bak Kwa Cookies by turning the CNY snack into a crunchy-topped butter cookie, melded with hints of BBQ sauce and spices. Book through Klook to get an exclusive discount on their Cookie Sets! Equal parts festive and fancy, Janice Wong’s Signature Singapore chocolate pralines series features the eccentric-sounding BBQ Bakkwa Pork Praline Popocks (try saying that fast). Think crackling pop rocks, bittersweet chocolate and hints of bak kwa, encased in this red and gold treat. 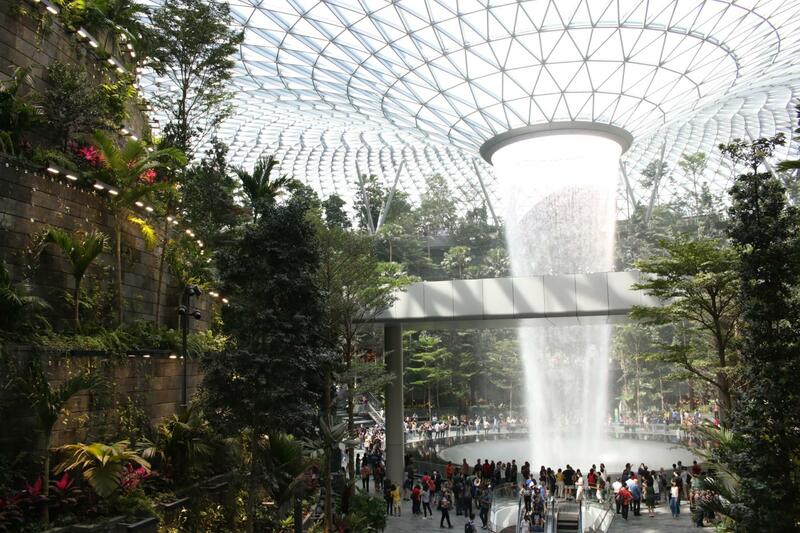 This one’s for the durian fiends. 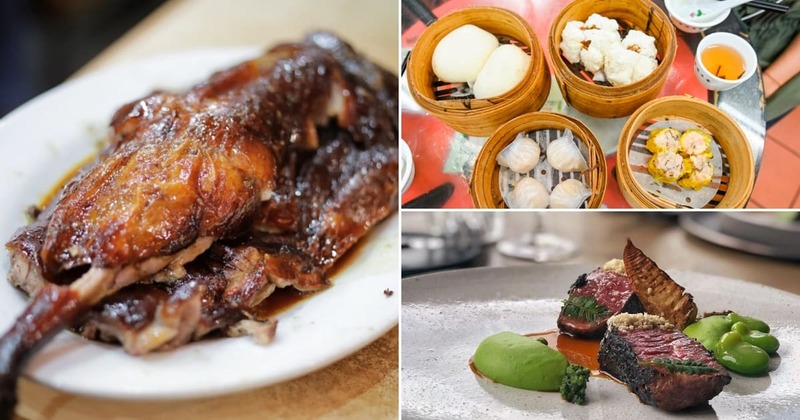 New Peng Hiang specialises in all sorts of exotic bak kwa flavors – from red wine to crocodile – and their Mao Shan Wang Pork Bak Kwa remains one of the more adventurous ones. Bring this along as a bai nian gift for that durian-obsessed friend. We recognise good bak kwa as being soft and sticky, with just the right amount of chew. But popular bak kwa brand Fragrance has developed a new type of snack, Crispy M, that turns our idea of bak kwa on its head. 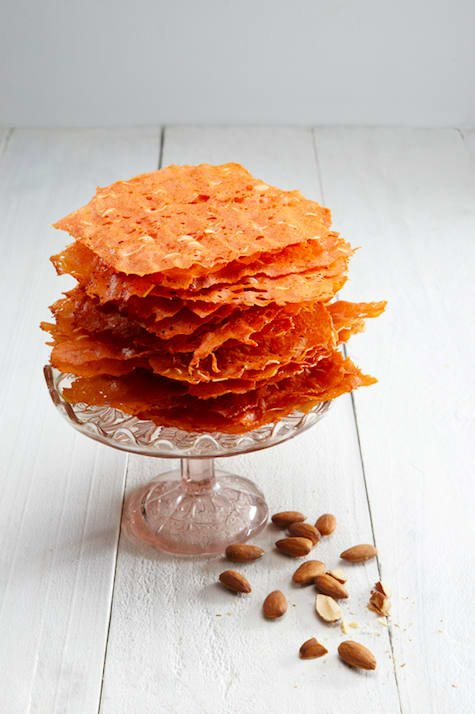 Made with fresh pork and almonds, the wafer-thin slices are all crisp and crunch – almost like potato chips. The popular Bendemeer Road bakery’s combines two classic CNY flavors in one, with their Bak Kwa Sesame Cookies. 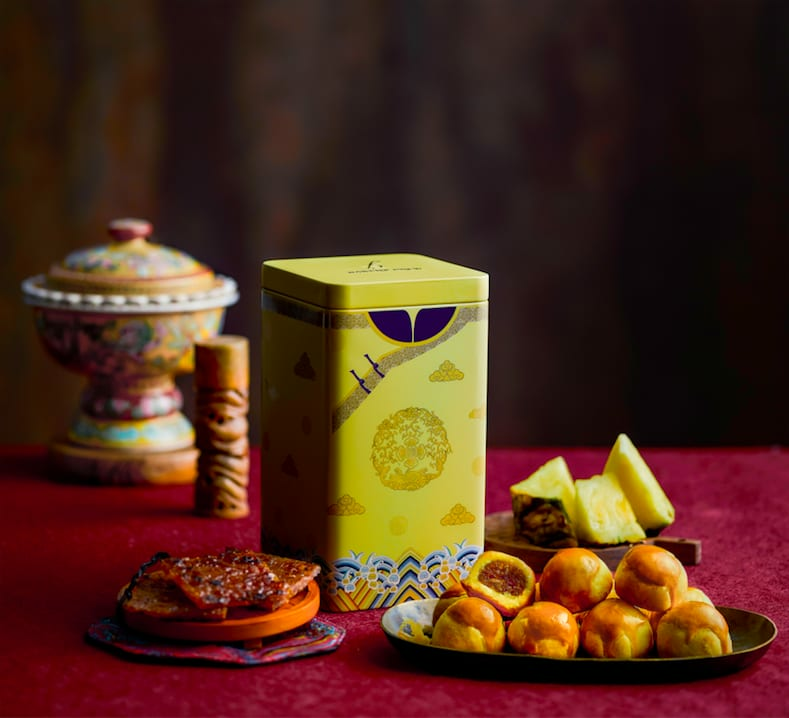 These little flavour bombs are packed with generous pieces of bak kwa and speckled with sesame seeds – giving the buttery cookies nice punch of smoky-sweet, rounded out with a hint of toasty nuttiness. 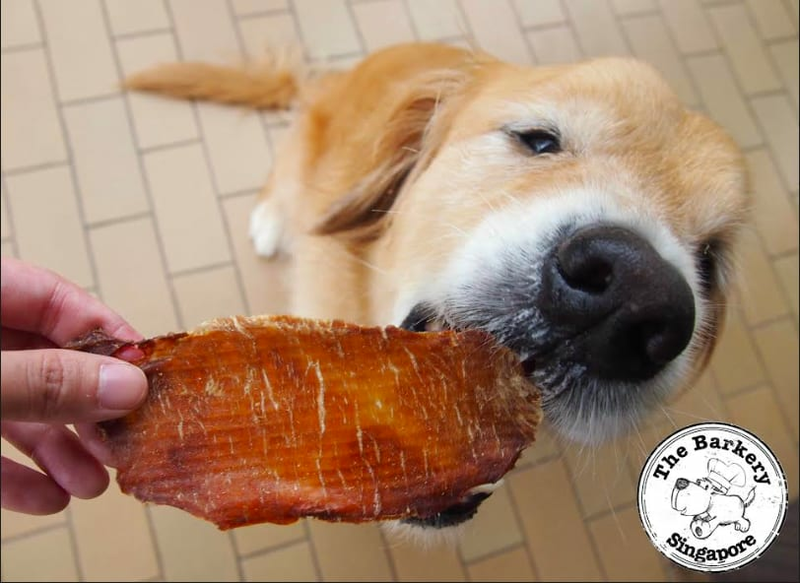 As tempting as they are, salty and oily slices of barbequed pork aren’t the best thing to feed your dog. Don’t fall for the puppy eyes. 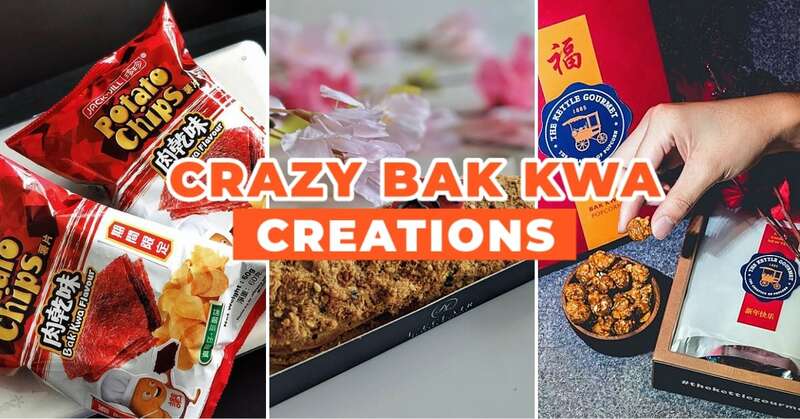 The Barkery Singapore has created Bark-Kwa, a healthier alternative that mimics the sinful original. Made from lean pork, apples and cinnamon, these snacks are way better for your dog, compared to sneaking them slivers of bak kwa. 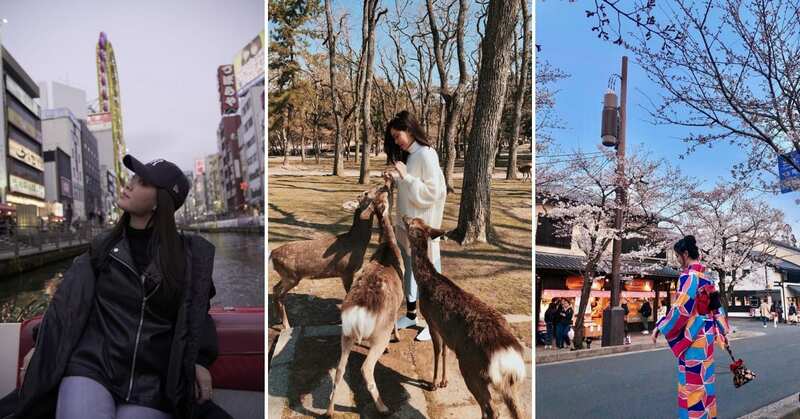 Now your dog can join in on the CNY festivities, AND you’ll be a responsible dog parent. Bai nian in style this year, with this life-like Bak Kwa Pouch from When I Was Four. The local design label’s latest release drops just in time for CNY – this 21cm x 14cm lined leather pouch is just the right size for stashing your hong baos and other essentials. 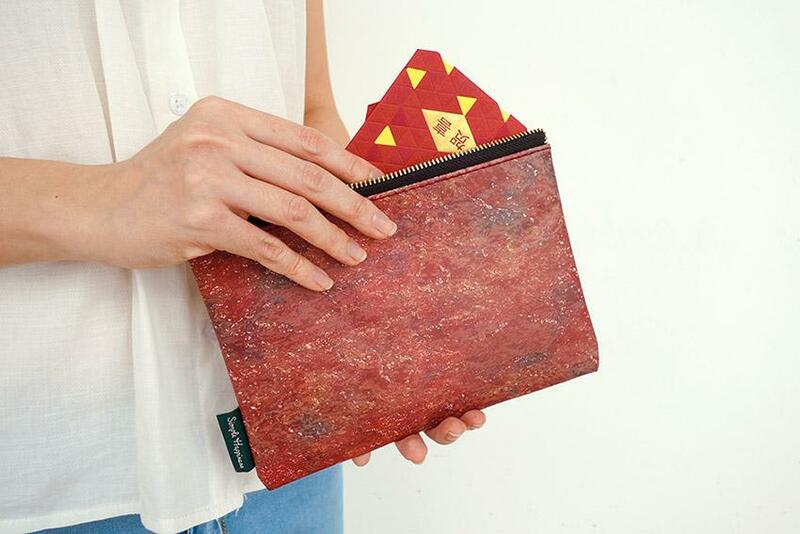 Your relatives will be doing double takes all day long as you parade your new pouch from house to house. 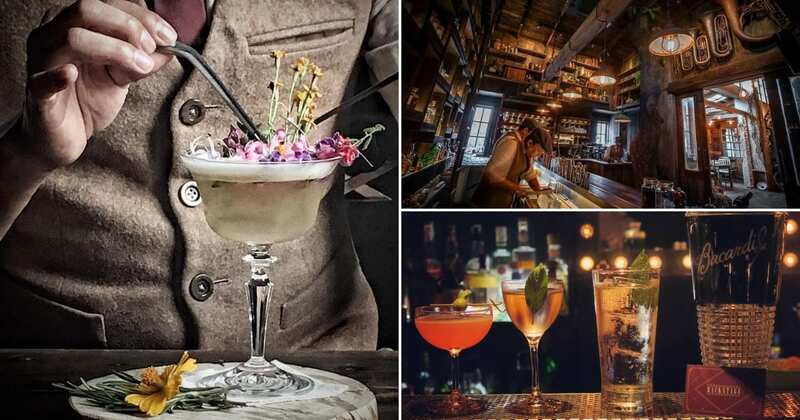 There’s no holiday like Chinese New Year for some indulging. 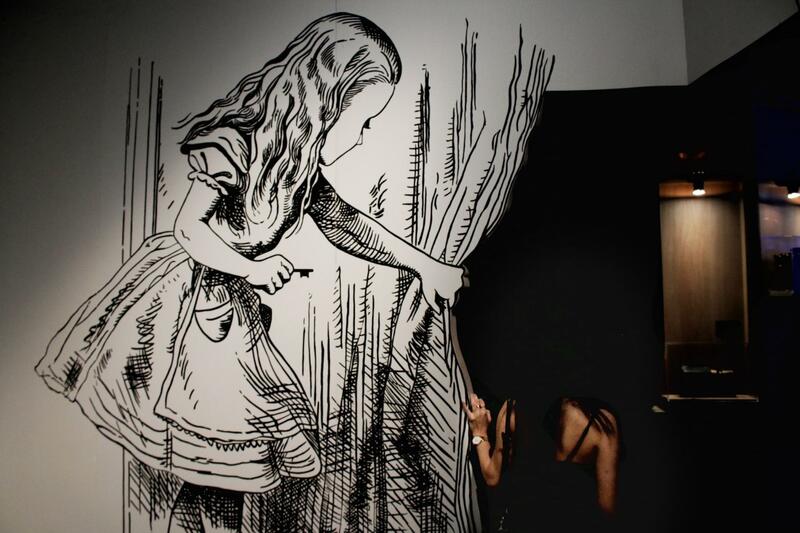 So live a little. 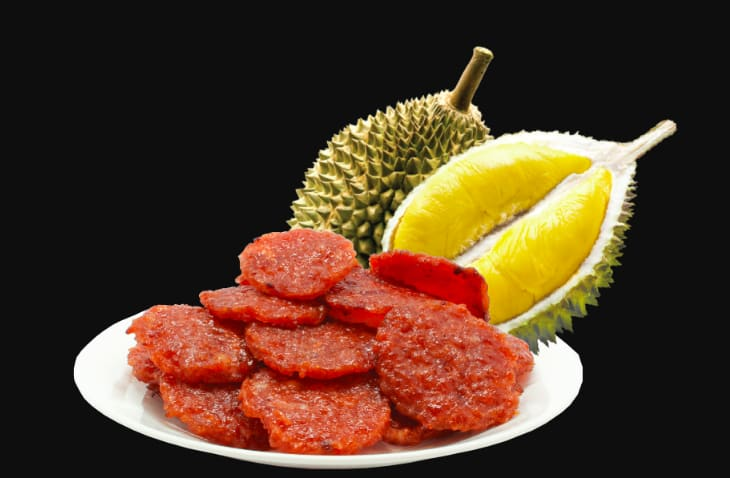 Have an adventure and try as many crazy bak kwa creations as you can, before the clock runs out.